We believe in winning. We believe that carefully crafted messages and effectivily designed presentations change people's decision making behavior. We are in the business of making belief. 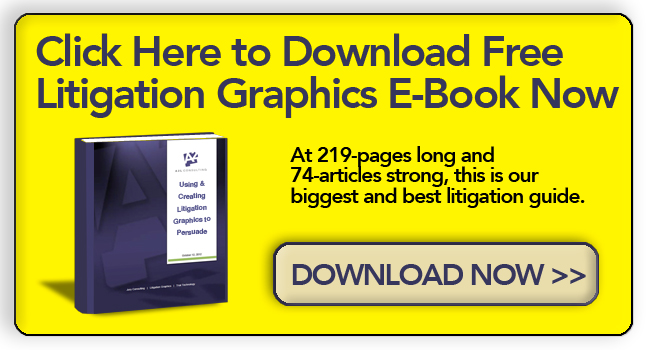 Founded in 1995 as "Animators at Law," A2L Consulting is the nation's leading attorney owned and operated litigation consulting, jury consulting, trial graphics and trial technology firm. We believe that effective messaging combined with effective presentations changes the outcome of cases. We delight in working with people who feel similarly. A2L supports the country's most prestigious law firms, sophisticated corporate clients, as well as government agencies. Our clients include litigators from 100% of the nation's top law firms, and dozens of Fortune 500s®. To date, A2L has helped generate favorable decisions in cases worth cumulatively more than $2 trillion. Our staff consists of attorneys, psychologists, experts in trial graphics design, animation, interactive development, and experienced courtroom trial technicians. How Juries See Trial Technology - Too Slick? Not just another "new media" firm, A2L Consulting was founded by attorneys to serve the legal community in a way no other firm has in the past. By combining attorney management, traditional artists and new media artists under one roof, we create an unmatched talent pool perfectly suited to major law firms and corporations. Put simply, we know the law, and we know how to make complex and boring information interesting and understandable for a judge, jury or the general public. We are the experts in trial graphics.